For current inputs above 100 mA, it is recommended that an input shunt resistor be used and the DRI-AC be configured for the proper input range. For example, a 5A current transformer output can use a 0.1 Ohm, 5 W shunt resistor with the input of the DRI-AC set for 0 to 500 mV AC. 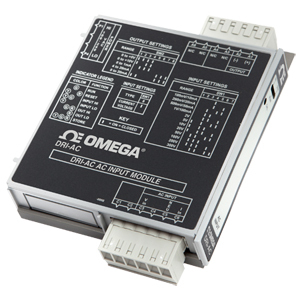 To set the input level within the dip switch configured range, simply apply the high input signal (voltage or current) and push the CAL button. The low input signal is then applied and pushing the CAL button again stores the low input signal. The high and low input levels are stored in non-volatile memory and correspond to the high and low output levels. These output levels are precisely adjusted using the input signal.